A record number of women are running for elected office this year, women's voices are louder thanks to the #MeToo movement and women are increasingly visible in corporate America. But the gender pay gap -- in which a woman earns 80 cents for every dollar earned by a man -- remains a "stagnant" obstacle for women, according to a new report. Each year, the gender pay gap results in $513 billion in lost wages each year for women, according to the report by the American Association of University Women (AAUW), a non-profit organization dedicated to empowering women and girls. The American Association of University Women has released a new report on the gender pay gap. And while the gap varies state by state, it's always there. In Louisiana, which ranks last on the AAUW’s list, a woman earns, on average, $34,708, compared to $50,445 for her male counterpart. In California, the state with the smallest gender pay gap, a woman still earns, on average, around $6,000 less than a man, according to the AAUW report. According to the report, there is only one job where women consistently earn more than men. As a wholesale or retail buyer, women actually earn around $4,000 more than men on average, the report found. In this undated stock photo, a businesswoman leads a conference meeting. Women’s earnings in that field are around $45,000, on average, according to AAUW’s report. In a more lucrative field, like financial services, women earn around $40,000 less than men, on average, AAUW found. 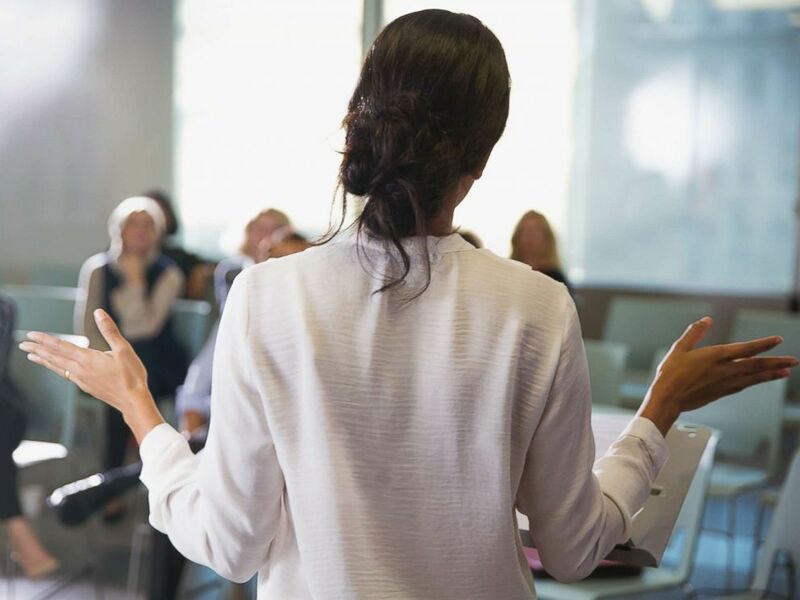 A report released by the U.S. Census Bureau in May similarly found that the widest wage disparities are found in sales and finance positions even though women tend to comprise 45 to 55 percent of that workforce. How can we fix the 'stagnant' gender pay gap? The gender pay gap does not exist in a vacuum, and it is impacted by everything from workplace culture to the leadership gap. The #MeToo movement, in which women spoke out about sexual harassment and sexual assault, is one reason Churches said she feels optimistic that change is coming. "It has allowed women, who are half of the labor force, to demand more respect and demand change and have an honest conversation on workplace issues," she said. "And the millennial generation and the women and girls behind them now just demand inclusion." "Employers are noticing that," Churches added. "They see the way of thinking is rapidly changing." In order to help women achieve the pay they deserve, AAUW has committed to training 10 million women in salary negotiation by 2022. 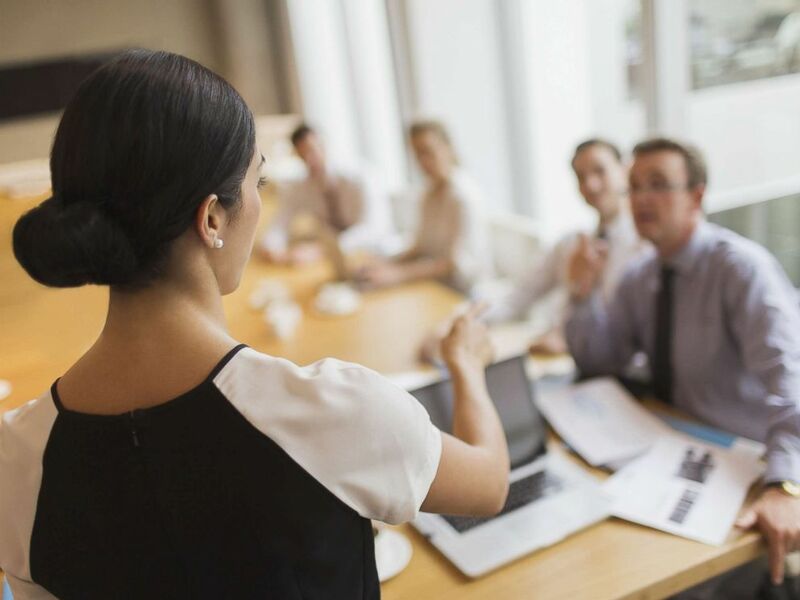 In this undated stock photo, a woman leads a meeting in a conference. The organization offers a newly-launched (and free) one-hour online training course in addition to its in-person workshops in cities across the country. "[The trainings] are really focused on the qualitative and quantitative data women need to understand the marketplace and their skills and abilities," Churches said. "It's knowing your geography and knowing your skills and being able to counter when negotiating." AAUW's two other areas of focus aimed at eliminating the gender pay are employer training -- having "frank conversations" and helping employers improve their practices -- and advancing fair pay laws. The Equal Pay Act, signed by President John F. Kennedy in 1963, amended the Fair Labor Standards Act to mandate equal pay for equal work by men and women. "The Equal Pay Act was passed in 1963 and we don't still have bouffant hair, but that law still exists," said Churches. "We’ve got to update our nations’ laws to reflect the workforce and what it is today." Pieces of legislation like the Fair Pay Act, which addresses unequal pay between female-dominated jobs equivalent to male-dominated jobs, and the Pay Equity for All Act, which would prohibit the use of prior salary history before a job offer, remain pending in Congress. Like any issue, the gender pay gap proves that voting matters, both at both the national and local levels. 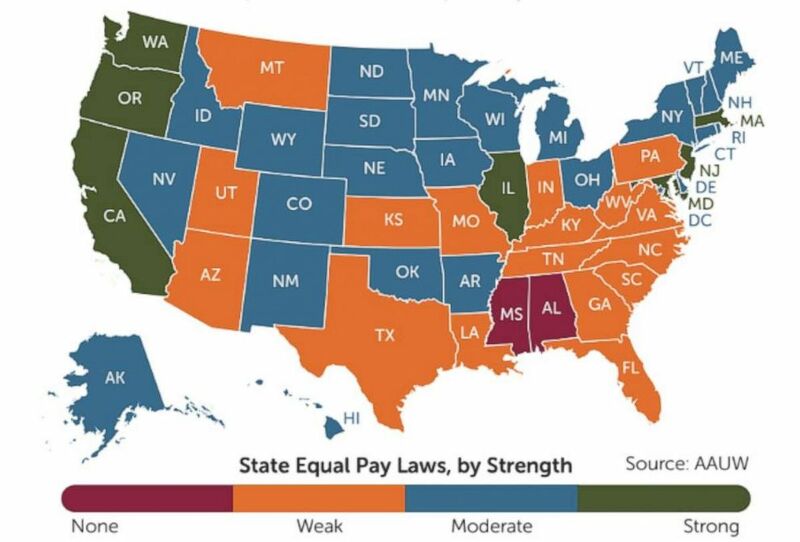 The varying strengths of state equal pay laws are shown in this graphic. The District of Columbia and 40 states have introduced new bills to strengthen equal pay laws locally by prohibiting using salary history in hiring, according to Churches. But the AAUW only lists seven states -- including California, Oregon and Maryland -- as having "strong" state equal pay laws, while two states -- Alabama and Mississippi -- are singled out for having none. In the states with weaker equal pay legislation, a greater pay gap exists, according to AAUW's report. "We have to keep talking about this issue," Churches said. "We have a responsibility to the women and girls of this nation."